• This Kit comes with 3 matching Shades of Color Refinish & Restorer. All you need to do is get close to your color and Blend It On no more guessing about the color match . A bottle of condensed Cleaner & Conditioner. A Bottle of Black & White Restorer to adjust the shade. 1 Sponge applicator. Filler for rips or tears & 2 Cotton Tip Swabs for testing & mixing. Plus the case can be used to mix and match the colors. Because refinishing leather professionally is expensive you can now do it yourselves. Couch, Sofa, Chair, Purses, Handbags, Furniture all can be done now, by you. 1. 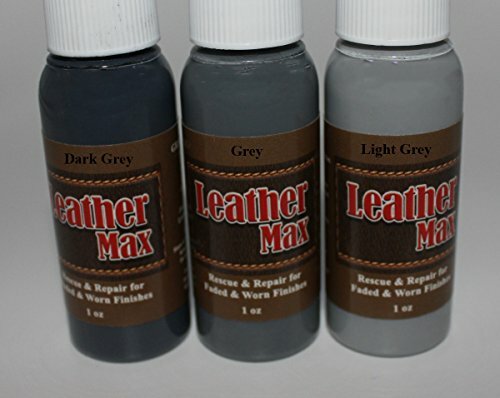 Choose the color set of Leather Max that matches your color the closest from the pictures here. 3. Use the cotton swab to test the color in a place that won't be seen, then mix and match using the other colors. (to lighten or darken the color use just a drop at a time of the Black or White restorer, it goes a long way) 4. Use the close pore sponge applicator to evenly apply Leather Max Leather Refinish Color Restorer to the item you are refinishing and restoring. These bottles will cover a couple square feet. To do larger items you will want to check out our, 4 Oz jars and 8 Oz bottles or our Leather Max Kits, Mega Kits. Please look at all the pictures and see how good it works! All our products come with full instructions and YouTube links for information on how to apply. Great for complete color restoring and repairing or changing a color. If you have any questions about this product by Blend It On, contact us by completing and submitting the form below. If you are looking for a specif part number, please include it with your message.